The Fashion and Textile Museum exhibition traces the history of 20th century art in textiles. Highlights include work by Georges Braque, Alexander Calder, Marc Chagall, Salvador Dalí, Sonia Delaunay, Raoul Dufy, Barbara Hepworth, Fernand Léger, Henri Matisse, Joan Miró, Henry Moore, Pablo Picasso, Ben Nicholson and Andy Warhol. In the years after World War II artist’s masterpieces were often transformed into commercial fabrics, either sold by the metre – art by the yard – or turned into garments and soft furnishings. 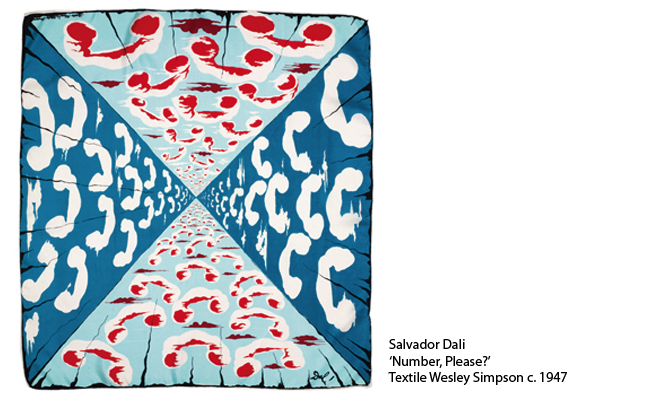 They appeared as Salvador Dali ties, Joan Miró dresses, and many other objects which are displayed in the exhibit. This entry was posted in Exhibits, Museum and tagged Fernand Léger, Georges Braque, Joan Miró, Pablo Picasso, Raoul Dufy, Salvador Dalí, Sonia Delaunay. Bookmark the permalink.